Editor’s note: This post is written by Cassie Alexander, a Red Cross volunteer who is also a registered nurse. She recounts her experience during Sandy. The post is cross-posted with her permission. 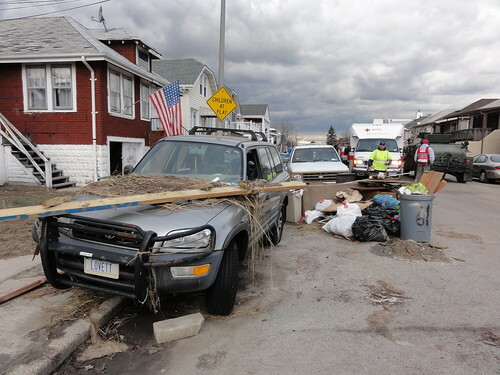 Photos are added from our Flickr set on Sandy response. The beginning of cleanup in East Atlantic Beach, Long Island, NY, a few days after Hurricane Sandy. 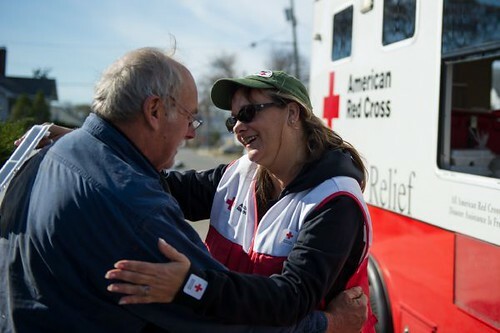 Photo by Carol Parkhurst/American Red Cross. My nursing school alumni board put a notice up that the Red Cross needed registered nurses very badly and by Thursday night I was signed up. I went to an orientation class that night, and then one on Saturday and by the following Wednesday – less than a week later — I was on a plane. I spent much of the intervening time being freaked out by how fast things were moving, and wondering if I’d made the right choice. My chapter lead was very sure that we’d go, so I raced from Ross to Marshalls trying to get clothing for a real winter and waterproof boots, and a money belt, wildly preparing to be sent somewhere – where, they didn’t know. People at the shelter kept asking us where we were from and being a little mystified that we’d all come in from three thousand miles away at the drop of a hat to help them. I don’t have an awesome answer for that, honestly. I’m not a saint, and I don’t always do what needs doing.